L’Auberge Acadienne Inn (website, 2375 High Road, Arichat, Nova Scotia, Canada, phone 902-226-2200) is an inn/restaurant/bar located on the Isle Madame in Cape Breton, Nova Scotia, Canada. Traveling to this picturesque maritime countryside is like taking a step back in time, to a land of grassy rolling hills dotted with bright flowers and quaint white cottages, overlooking an undulating coastline and sandy beaches. This close-knit community is welcoming and friendly. 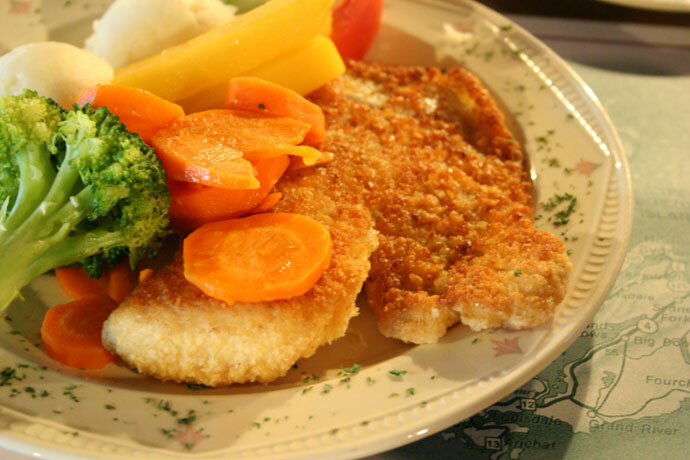 At the L’Auberge Acadienne Inn I enjoyed a fine meal of breaded Atlantic Haddock fish – pictured below – which was served with perfectly cooked vegetables and delicious mashed potatoes. Price for the meal was under $15. We hope you enjoy the great Cape Breton restaurants on Dine Out Here Vancouver.